But if you are scripting and want to translate an error code, how can you do that? Well there is a handy little dll file called SrsResources.dll that comes with the installation of the Configuration Manager Console, and can be found here: %ProgramFiles(x86)%\Microsoft Configuration Manager\AdminConsole\bin\SrsResources.dll. Using this dll, we can translate error codes for Windows, Configuration Manager, WMI etc, and even translate status message IDs. It will call other dll files when it needs to, to find the error string. Pretty cool 🙂 Using this SrsResources.dll creates a log file in your %TEMP% directory called SCCMReporting.log, and this log quickly increases in size, so if you use it a lot check the size of this log file from time to time. The logging can be useful for identifying which dll was used to find the error string. To convert between decimal and hexadecimal and vice-versa, we can use this simple function. With PowerShell, you can convert to decimal natively in the console just by entering the hexadecimal code, but using this function allows us to convert both ways, and is more useful for scripts. 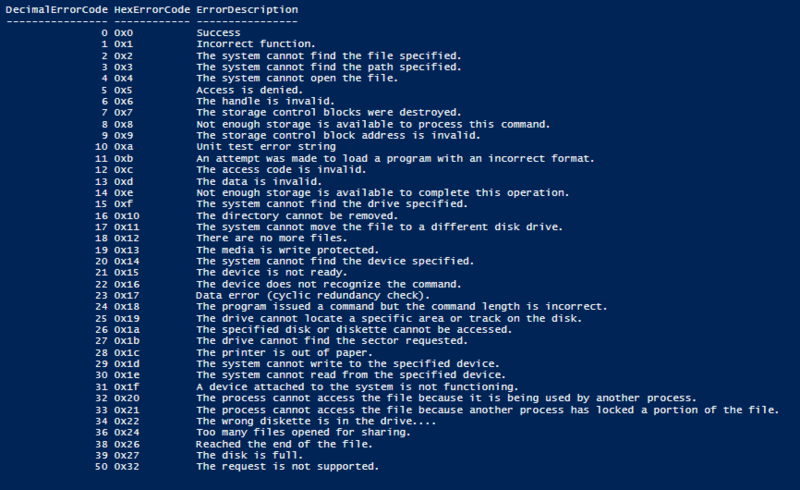 Finally, wrapping all this together, here is a script that uses both functions we have created earlier, and will return all the machines that are in an error state for a ConfigMgr application deployment, with the error code and description. Because we filter using the current application revision, this actually returns more accurate results than the ConfigMgr console > Deployments node, as that data will include previous application revisions where no data is available for the current revision, which produces misleading results. 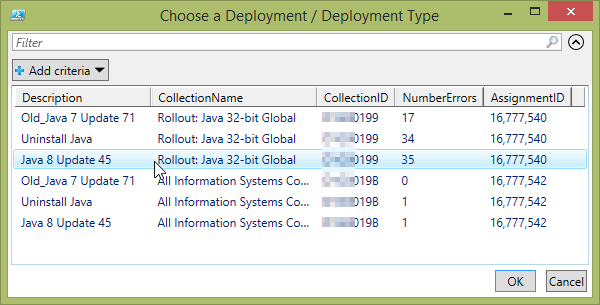 Then we query for the deployments and deployment types for that application, and choose the one we want. The numbers of errors is returned, but as previously mentioned, this may not be completely accurate at this stage. Then we return the results translating the error codes into their descriptions. 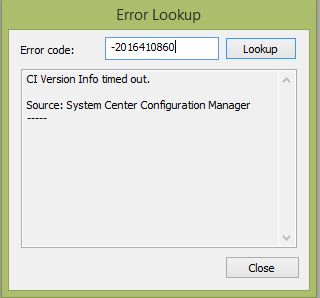 Note that WMI stores the error codes as unsigned integers, but the ConfigMgr console displays errors as signed integers, so we do a conversion and include both in our results. 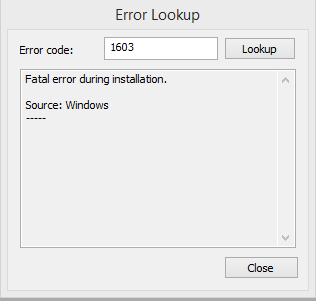 deployment, with the error code and error description. 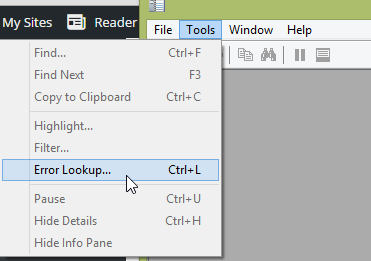 need to change the localization in this function to your region, eg "en-US". In any enterprise environment there will be some common software that you will install on all your computers, and some of these are frequently updated to new versions, such as Adobe Flash Player, or the Java Runtime for example. So I wrote a little script that runs as a scheduled task every day and checks the internet for the current version of some common software, and sends me an email when a new version is released. It works by checking an internet URL that contains the current version number of that software, then finds the HTML element in the page that contains that number, and extracts just the number. Then it compares it with a local file that contains the current (or previous) version number, and if the version number has changed, it will update the local file with the new number and send me an email notification. 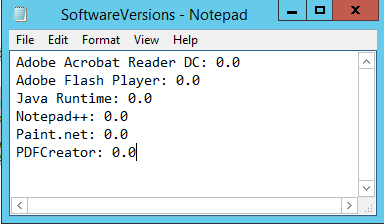 Currently it will work for the following software, but can be customized for others. Save and edit the PowerShell script below, entering defaults for the email parameters and the location of the SoftwareVersions.txt file. You can also enter these parameters when running the script. The first time you run the script it will populate the text file with the current version numbers of each software, and send you an email for each. The next time it runs, it will check the version number found online with the version number in the file, and only send an email if something is different. 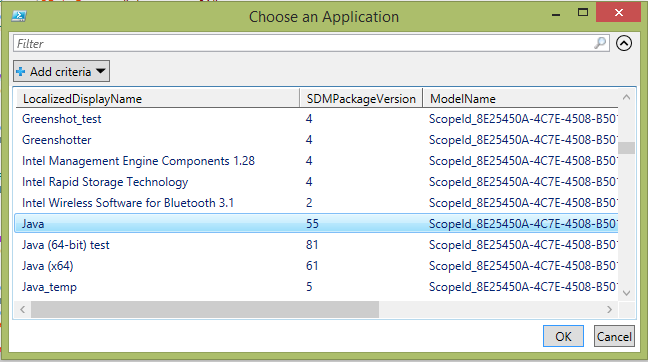 Use a Windows Scheduled task to schedule the script and perform regular checks of the current software version. You can add new software by copying and pasting a new section of the script, finding a URL that contains the version number, finding the HTML element in the page that contains the version number, then using filters and text manipulation to get just the number itself from the web page. You also need to add a line to your SoftwareVersions.txt file, and modify the code that uses it to search and update that line of the text file. Now I use the following code to filter the “innerHTML” element using the filter “Version ..*”, which gives me the string “Version 2015.007.20033”, and using the “Split” method, I trim off the “Version ” part leaving just the number: “2015.007.20033”. Now I get the content of the SoftwareVersions.txt file, and find the string, or the line, that contains the name of the software. Using the Substring method, I remove the first 25 characters of the line, to leave me with only the version number. If they are different, I send myself an email, and I also put the new version into the text file, which becomes the reference for the next check. an email will be sent notifying of the new version number. The stored version number will then be updated for future version checking. Checks the internet URLs of common software for the current version number and sends an email if a new version has been released. Write-Verbose "Checking Adobe Flash Player"
Send-MailMessage @EmailParams -Subject "Adobe Flash Update" -Body "Adobe Flash Player has been updated from $CurrentFlashVersion to $NewFlashVersion"
write-verbose "Setting new stored version number for Adobe Flash Player"
Write-Verbose "Checking Adobe Acrobet Reader DC"
Send-MailMessage @EmailParams -Subject "Adobe Acrobat Reader Update" -Body "Adobe Acrobat Reader DC has been updated from $CurrentReaderVersion to $NewReaderVersion"
write-verbose "Setting new stored version number for Adobe Acrobat Reader DC"
Send-MailMessage @EmailParams -Subject "Java Runtime Update" -Body "Java Runtime has been updated from $CurrentJavaVersion to $NewJavaVersion"
write-verbose "Setting new stored version number for Java Runtime"
Send-MailMessage @EmailParams -Subject "Notepad++ Update" -Body "Notepad++ has been updated from $CurrentNotepadVersion to $NewNotepadVersion"
write-verbose "Setting new stored version number for Notepad++"
Send-MailMessage @EmailParams -Subject "Paint.Net Update" -Body "Paint.Net has been updated from $CurrentPaintVersion to $NewPaintVersion"
write-verbose "Setting new stored version number for Paint.net"
Send-MailMessage @EmailParams -Subject "PDFCreator Update" -Body "PDFCreator has been updated from $CurrentPDFCreatorVersion to $NewPDFCreatorVersion"
write-verbose "Setting new stored version number for PDFCreator"
Recently I was given an interesting task – set the default wallpaper on new computer builds with ConfigMgr OSD, but don’t lock it such that users can’t change it. 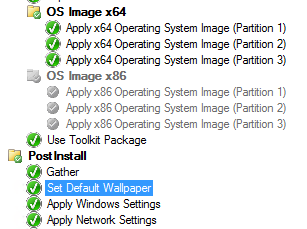 It turns out it is simple enough to do, but it requires changing the default wallpaper that comes with windows, which can be found at C:\Windows\Web\Wallpaper\Windows\img0.jpg. If you check the security on that file however, you’ll notice that only the “TrustedInstaller” has full permissions to it, so to change it in the online OS requires messing with permissions. 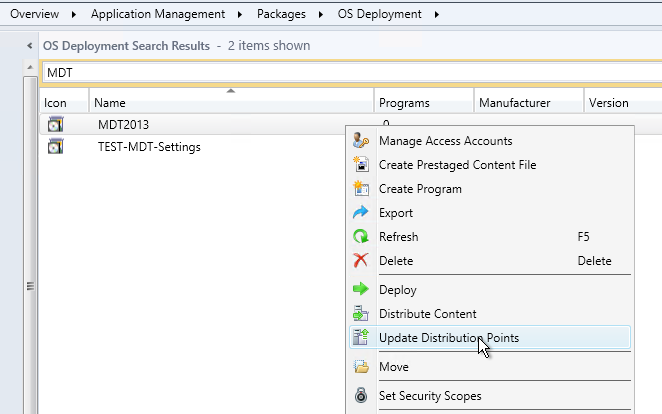 Instead, you can change offline during the WinPE phase of the deployment, which bypasses the permissions problem. This procedure requires MDT-integrated ConfigMgr 2012, and also requires Windows PowerShell to be added to your boot image. I’ve tested on Windows 7 but should also work with Windows 8.1 as it uses the same location for the default wallpaper. The script will load some task sequence variables, rename the existing default wallpaper to “img1.jpg”, and copy the new “img0.jpg” into the same directory. 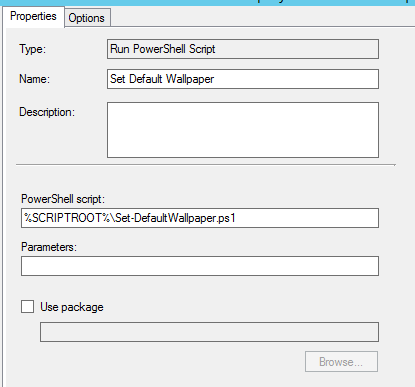 Copy the new wallpaper and the PowerShell script to the Scripts directory of your MDT package source files, and update the MDT Package to your distribution points. 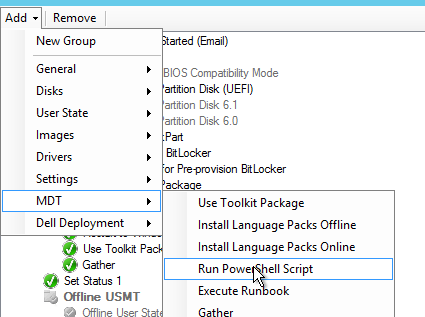 Now edit your OSD task sequence and after the “Apply Operating System Image” Step and before the “Apply Windows Settings” step, add a “Run PowerShell Script” step from the MDT menu. That’s it! After OSD, your computer will have two files in the location C:\Windows\Web\Wallpaper\Windows, the new default wallpaper, and the old one renamed to “img1.jpg”. Anyone who logs into the computer will get the new default wallpaper, and they are free to change it if they wish. If you want to also change the colour scheme in Windows 8.1, there’s a nice post on the Coretech blog. Today I got an interesting question – Is it possible to gather the sizes for all packages referred by a OS deployment task sequence? I have a script that will find all package sizes for any group of packages you select, but not specifically for a task sequence. But I found it can be done quite easily. Simply enter your task sequence name and your site code, and the script will return all the packages referenced in that task sequence with their package sizes, and also give the total count and total size. 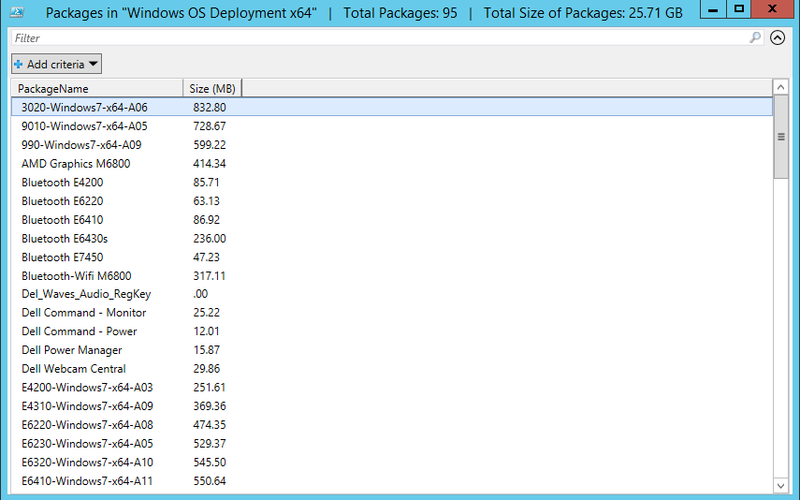 $TaskSequenceName = "Windows OS Deployment x64"
$PKGs | Out-GridView -Title "Packages in ""$TaskSequenceName""   |   Total Packages: $($Stats.Count)   |   Total Size of Packages: $(($Stats.Sum / 1KB).ToString(".00")) GB"
New book! 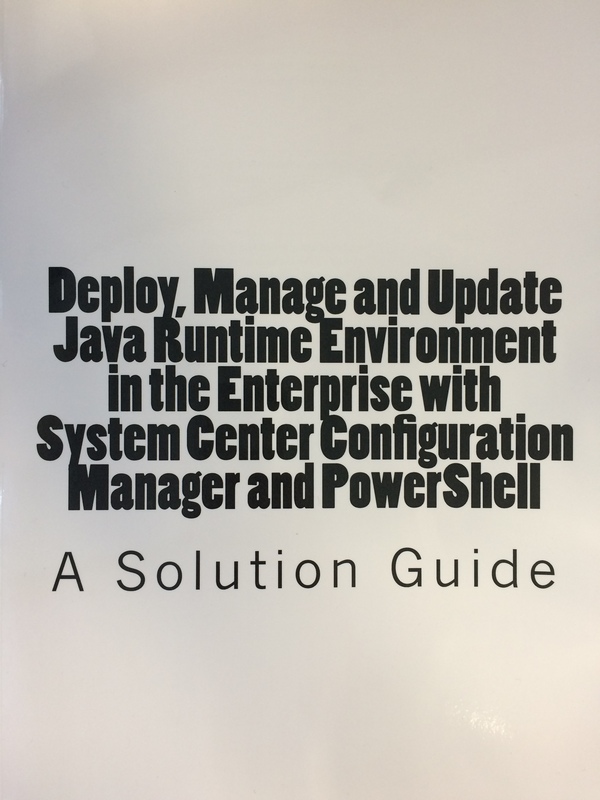 Deploy, Manage and Update Java Runtime with Configuration Manager and PowerShell. Available on Amazon.